This article, written by StFXAUT Communications Officer Philip Girvan, will appear in the Spring-Summer 2018 edition of The Beacon . The Special Olympics Canada 2018 Summer Games are taking place in Antigonish from July 31 to August 4. These games are a qualifying event for athletes to represent Canada at the 2019 Special Olympics World Summer Games. 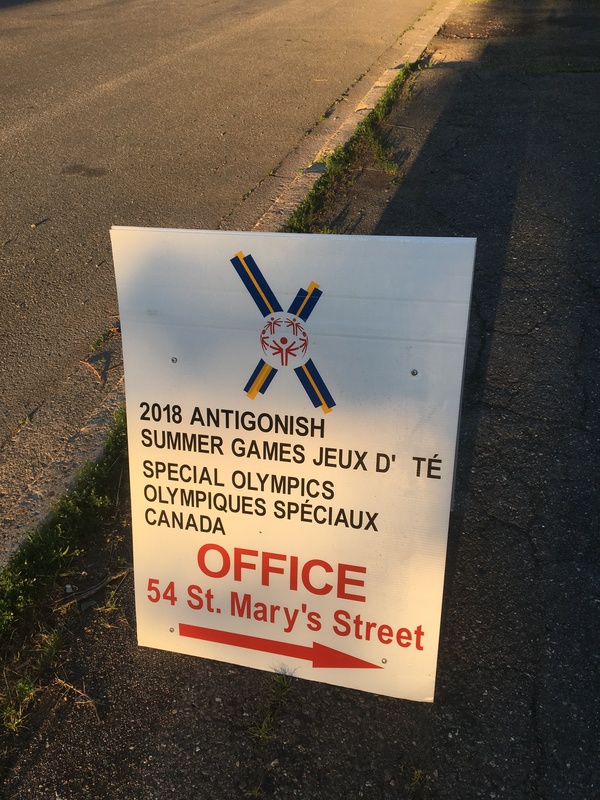 While these are the first national games hosted by Antigonish, and only the second to be held in Nova Scotia, Antigonish has hosted several Special Olympics Nova Scotia Summer Games. In addition to hosting a number of sport events, StFX University is serving as host of the athlete’s village. A number of people aligned with StFX, including AUT members, students, alumni, and other StFX personnel, have already volunteered hundreds of hours to get to this point, and, during the games, hundreds of volunteers will volunteer even more hours. The Beacon had opportunity recently to speak with two StFX alumni volunteering with the Games: Marc Champoux, co-chair of the Games Organizing Committee, and Alison Sampson, who is staffing the family services booth. Champoux had no prior involvement with the Special Olympics before being contacted by his friend, Dr. Bill Stanish, who, as Champoux, put it, “approached me one day and said, ‘I need to ask something of you and I need you to say yes’”. Sampson (BBA, ‘02) works as an HR Advisor with the StfX University Human Resources Department, also got involved with the games because of a face-to-face request. Carla Gillis, a colleague of Sampson’s from her time with conference services, asked her to lead the family services booth. The booth will provide a space where friends and family of athletes, officials, trainers, and coaches can receive schedule updates, be provided maps, be directed to food services on campus, and be offered other logistical support. The Games are expected to draw over 9000 spectators. Champoux (BBA, ‘88) told The Beacon that the Games are “going to be a significant economic impact for the entire county. My understanding is that most hotels beyond Truro, Port Hawkesbury, and Guysborough are booked”. The Olympics are volunteer-driven. Champoux estimates that approximately 800 people will volunteer at these games, and, of these, around 90% come from Antigonish and Guysborough. Champoux commented upon the long ties to Special Olympics held by the volunteers that he met, including some of these that have lasted decades. Champoux suggested that “at the end of it, it’s just about such joy. This is about athleticism. It’s just about the joy of being an athlete and participating and seeing all that just draws people in and keeps people drawn in”. When asked why she got involved, Sampson replied, “It was easy. For one, I’m a planner. I love to plan. I love to be involved. I love to do logistics and things like that. It was an easy yes to say to Special Olympics. They’re such a fun and great group to work with’. Champoux encourages everyone able to to attend, stating that “I think it’s going to be an event this community will remember fondly for a long, long time’. This entry was posted in News and tagged alumni, antigonish, community, games, novascotia, service, specialolympics, stfx, stfxaut, stfxuniversity, university. Bookmark the permalink. Both comments and trackbacks are currently closed.